I don't know if this would be considered a traditional scone - perhaps a variation on a traditional scone? Scone purists might even consider it an aberration. I served these to a nice group of women at a Spring tea event a few years ago and several commented on how much they enjoyed the "biscuits", reminded them of scones! 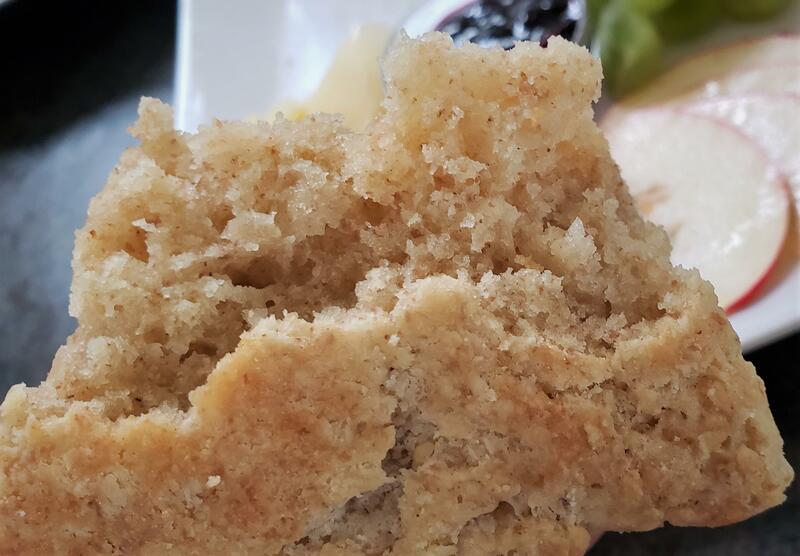 In my thinking scones are more crumbly, tender whereas a good biscuit is fluffy, almost flaky soft...both benefit from minimal handling and lots of butter. For my "scones" today I was using up some extra fresh milled rye, spelt and Marquis wheat flour from yesterday's bread bake mixed with some organic all purpose white flour, baking powder, sea salt, a bit of sugar, some excess starter from yesterday, cubed pieces of frozen butter and enough buttermilk to make a shaggy dough. I patted it down gently on a floured surface, folded it once and shaped into a round on a piece of parchment paper cut to fit the pre-heated heavy cast iron baking pan I was using and scored the pieces before baking at 400 F for 25 minutes. Scone or biscuit, whatever you want to call it, they turned out nicely and taste like...a good scone! 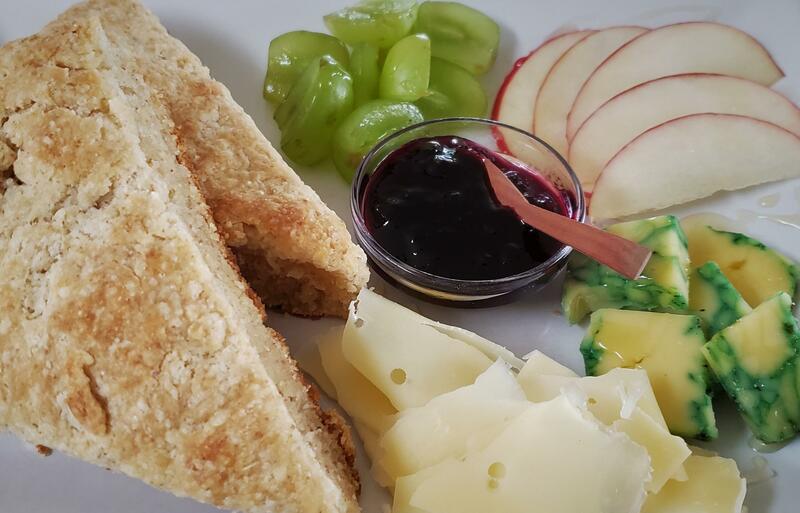 I served them warm with a wild blueberry preserve; sliced grapes, apples with a drizzle of raw fireweed honey, Sage Derby and Bergeron cheese. My favourite way to enjoy scones is toasted and with strawberry jam. Bread looks very inviting too. Thanks Abe. Whatever they're called, whatever shape, I too enjoy them toasted with jam! I went and read just a little bit about scones, and from even just that little information, it's clear that the degree of variation among scone recipes, and the variations in what's even called a scone, is far wider than the difference between a scone and an (American word usage) biscuit. The name "biscuit" (meaning baked twice) doesn't literally fit that type of biscuits, but clearly that's what they're called; in the same way, a number of quite different things are all called "scone". One little confusion comes from the fact that scones were being made before the time that baking powder became generally available. Should the name "scone" be reserved for the pre-powder type? The answer is "by some people, sometimes". 🙂 And so on. So, when someone says your scones are biscuits, and then says that these biscuits are almost like scones, you've simply entered Foggy Definitions Land, and there's no correct way to resolve it other than to smile and nod. Very true David....it's more a case of "tomayto, tomahto" and as you rightly conclude, it really doesn't matter as long as there's enough to go around! They look delicious! I need the recipe! I thought I was looking at a gâteau basque! I've never seen a plate-sized scone, but that is extremely beautiful (so what else is new). And the crumb! Gateau basque...I haven't had that for many years, I think the last time was at high tea on an Alaskan cruise! As for the shape, I really like baking in cast iron and the round skillet seemed the most efficient way to bake the scones with minimum fuss shaping them. Thanks for your kind comments Carole. It must have been delicious with the accompaniments you out with it. 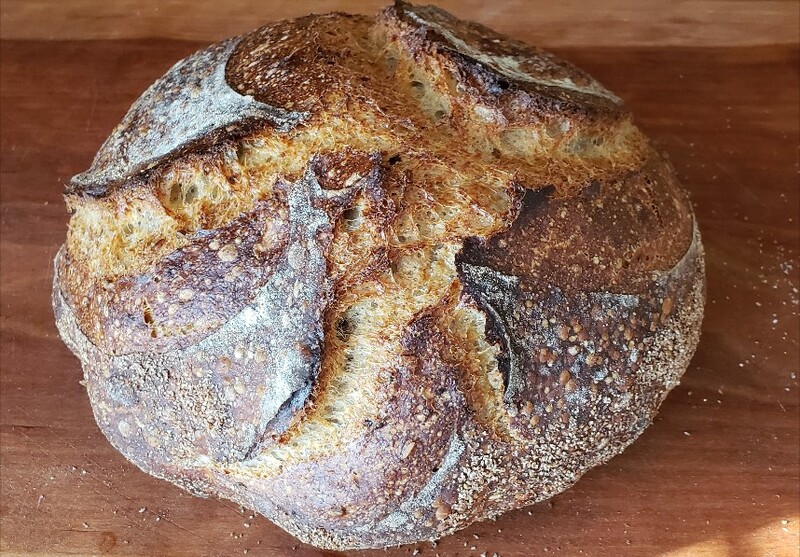 And of course, I love the shot of that gorgeous loaf! Wish I could taste it! Hi Danni, it would be great to have an opportunity to share baking wouldn't it? I notice Dab is offering to help with a Scottsdale spring get-away for wayward and still winter-cold Canadians. That will be quite a treat for anyone that makes the trip, lots of good baking, good food and a chance to meet face to face...all good! You could probably do a 6 loaf carry on luggage for the flight, your bread would arrive still fresh and tasty! Oh I’m thinking about it for sure! However, not too many people have expressed interest. 😥 Hey, what about you? I do the same thing when I make scones, but I make the round on parchment, cut the wedges and then separate them a bit so the edges all get toasty and brown.